The popular online store Amazon keeps a record of a customer's likes and dislikes by tracking activities on Amazon properties but also on third party sites that display Amazon advertisements. These information are then used to display personalized ads to the user. Personalized advertisements can appear both on Amazon websites but also on third party websites that display ads from Amazon. Some Amazon users may prefer that Amazon is not keeping a record of visits to third party sites while some might not want to see personalized ads on Amazon sites and third party sites. Personalized ads can be problematic when multiple users use a single computer system as the recommendations are then all mixed together (unless each customer has an individual account that is used whenever the web browser is used). No personalized ads are displayed to the Amazon customer on Amazon first party sites and third party sites that display Amazon ads. 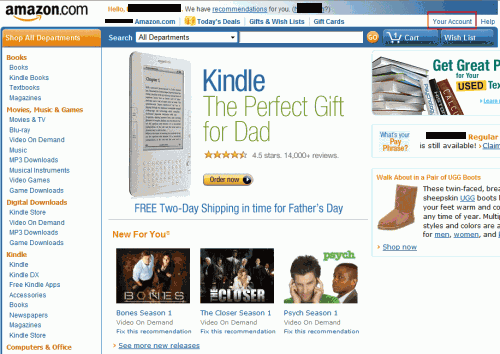 Amazon will not record the user's visits to third party sites that display Amazon advertisements. It is fairly easy to opt-out of Amazon personalized ads and third party information collection. Open the Amazon website and locate the Your Account link in the top right corner of the screen. Scroll down on the next page until you see the link "Your Advertising Preferences" in the Personalization section. Clicking that link opens the following screen. The opt out button on the left can be used to disable personalized ads and information collection on third party websites. Personalized Ads. We want the ads you see on Amazon.com and its affiliated sites, as well as the ads you see from Amazon or its affiliates on other third-party websites, to be as relevant to you as possible. Often, our advertising is based on personal information about you, such as your purchases on Amazon.com, visits to Amazon Associate web sites, or use of payment services like Checkout by Amazon on other web sites. 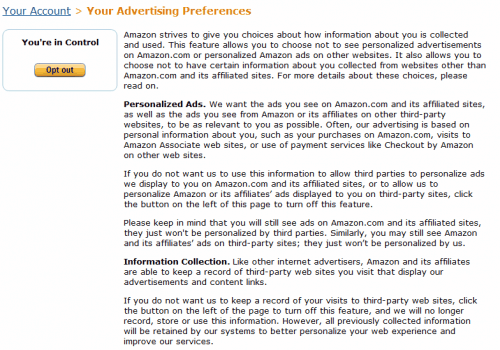 If you do not want us to use this information to allow third parties to personalize ads we display to you on Amazon.com and its affiliated sites, or to allow us to personalize Amazon or its affiliates’ ads displayed to you on third-party sites, click the button on the left of this page to turn off this feature. Please keep in mind that you will still see ads on Amazon.com and its affiliated sites, they just won't be personalized by third parties. Similarly, you may still see Amazon and its affiliates’ ads on third-party sites; they just won’t be personalized by us. Information Collection. Like other internet advertisers, Amazon and its affiliates are able to keep a record of third-party web sites you visit that display our advertisements and content links. If you do not want us to keep a record of your visits to third-party web sites, click the button on the left of the page to turn off this feature, and we will no longer record, store or use this information. However, all previously collected information will be retained by our systems to better personalize your web experience and improve our services. The opt out button will turn into an opt in button if it is pressed to give the customer an option to activate the feature again. Update: You can also use the link we have posted to get directly to the opt-out page. You do not even have to be signed in to opt-out or in again. Excellent post — it’s about time that Amazon did this. We can only hope that Facebook will offer the same kind of control over the information they now collect off of facebook.com. … along with the details for nearly 250 other ad networks as well. Note that this does not yet exist on amazon.ca (Canada). I do not know about other country versions of amazon.